We all did the happy dance, for sure — but what has surprised me most of all is she hasn’t been wearing diapers at nap-time this week! Sometimes she’s woken to use the bathroom, or slept through, but she’s been dry now for 2 weeks at school (including this week at naps) and she has been going in public places (when need be …and with a fight but still …) so I feel like we have turned a MAJOR corner here on this journey to self-sufficiency/independence. Of course, doing well these past three weeks doesn’t mean accidents won’t happen — she’s still only two — and we haven’t tackled the overnight diaper situation yet, which is bound to be a challenge. 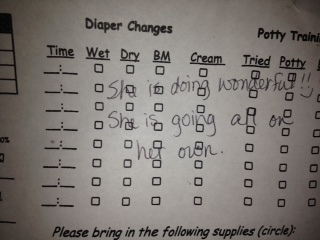 But I think we can safely say, she really is day-time/nap-time potty-trained! While the chicken pox was not something I’d wish on anyone, being home and quarantined three weeks ago really did help in the world of potty-training. Hurrah for something positive coming out of an otherwise sucky situation! Previous postI Missed My 5-Year Bloggiversary!